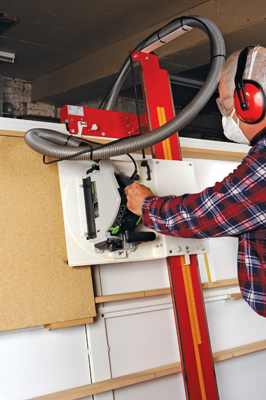 Cutting man-made boards such as MDF or MFC can present a problem if you are looking for speed, accuracy, working safely and the right capital outlay. You have to make choices. A circular saw and guide rail are the most basic combination, working precariously on sawhorses. At the upper end of the market there are various high-priced options, both tablesaws with board cutting sliding tables and the rather more compact vertical panel saws. Sitting slap in the middle cost-wise are the two Zapkut models built in the UK. They are both cost-conscious models with features specific to each and are available with several different options. This machine is available in two versions to suit either 8 x 4ft or 10 x 5ft maximum panel sizes. 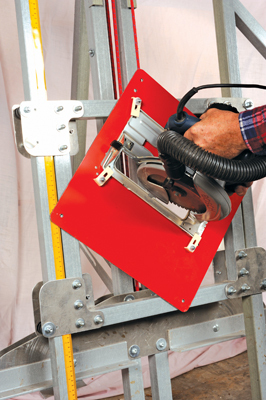 All Zapkuts accept standard portable saws, which can be easily fitted into place. The ZK has a square mounting plate so you can lift it out and turn it 90Âº to go from rip to crosscut or vice versa. 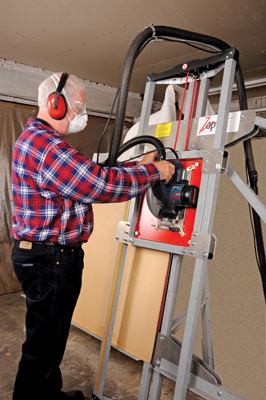 The beauty of the ZK model is that, unlike other vertical panel saws, it can be folded for compact storage and easily transported in a van from site to site. The whole assembly operation takes place in a couple of minutes and you are ready for action. 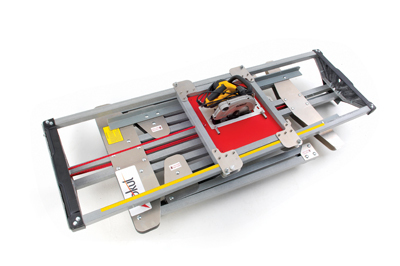 The saw head runs on a vertical frame restrained by a tough bungee cord running over rollers. The height is set by means of a stick-on scale and locked by a knob once adjusted for cutting. 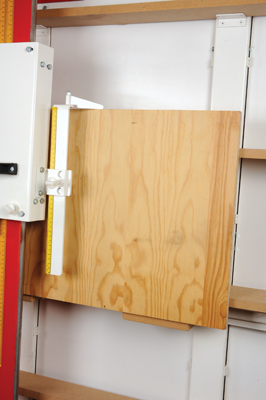 To rip cut, the board is fed under the static saw head, so a non-plunge or plunge-and-lock saw is needed. 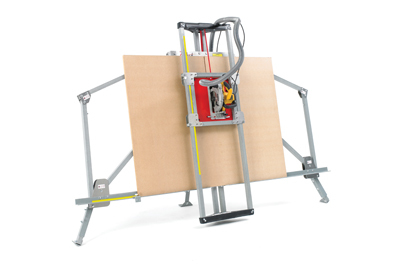 It features a 'quick-stop' for length cutting and a mid-height support for smaller panel sizes. An extraction hose can be fitted via a series of Terry clips that lead the hose out to the rear. The ZM is a bigger beast, intended for workshop use, although it is still movable if required. 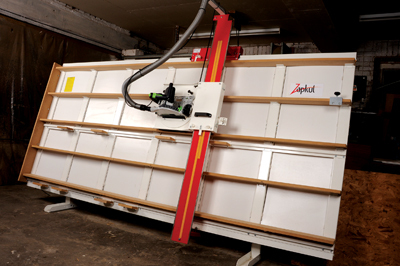 It can cope with boards up to 10 x 7ft and has a 'quick-stop' and mid-height supports for cutting smaller panels. 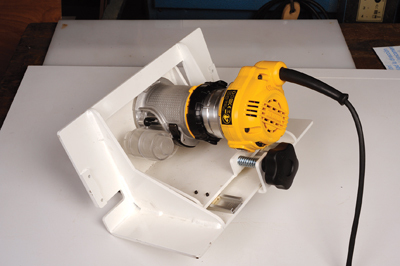 On this model, the saw head slides up and down a column using roller bearings and a bungee restraint. 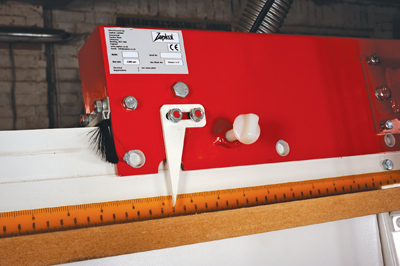 The column moves sideways for rip cutting using bearings for smooth motion so the board being cut is static, unlike the ZK model on which it has to be pushed through. In common with all vertical units, it doesn't have a big footprint and can be placed against a wall. 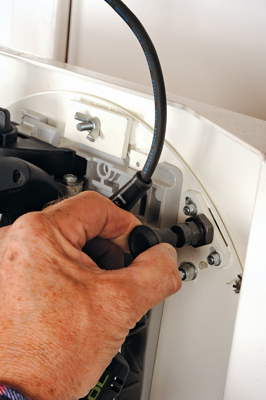 The saw- mounting system consists of a rotating mounting plate and a lock knob to change from rip to crosscut. Scales are provided for accurate cut setting and an extraction hose can be fitted and fed off out of the operator's way. There are three capacity options to suit your likely requirements. 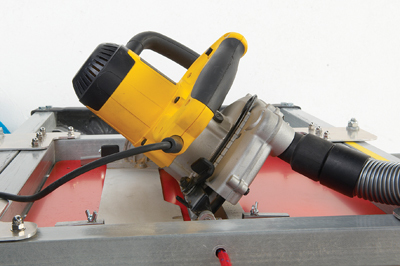 It comes as standard with a high-quality plunge saw, which can be easily removed for use as a portable saw on the bench. Capacity: 8 x 4ft max. Capacity: 10 x 5ft max.